Description: There are many good things that you can say about SalesLogix 6.2; unfortunately speed is not one of them. The good news is that SalesLogix is working on addressing these issues, but in the mean time there are a few things that you can do to improve your SalesLogix 6.2 experience. When you first open SalesLogix do you open up to All Accounts? Do you know that this actually slows down your performance? The initial group that you open SalesLogix to should be a small group (such as latest contacts). In the General Settings box you can choose which Main View is opened first. 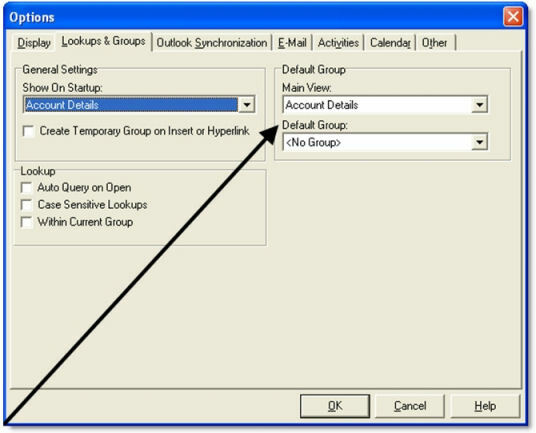 The Default Group box is where you define what group is opened first. A good choice would be Latest Accounts or some other similar group that is not too large. The next time you start up SalesLogix your system will start up with this smaller group. This registry setting will NOT increase speed - but WILL reduce the memory footprint. In fact, this registry will slow down the product if set to "T". DontCacheGroups means that groups will be refreshed every time you access them (not cache them). This is actually slower if you use large groups often in the same session. This setting is recommended to be set to "T" if you have an issue with memory on a machine - such as Citrix. 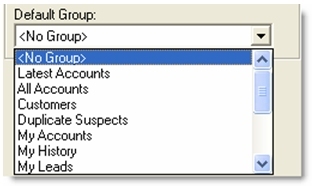 Change the key value for DontCacheGroups to "T"
Do not have too many other things running on your SQL server. I have seen people use their Domain Controller for their SQL server. Don’t do this. A DC has processes and overhead you do not need. In fact your SQL server should be a member server and have no participation as a controller. Also unload any other unnecessary processes from this computer such as IIS, Knowledgesync, disk indexing … you get the idea - if at all possible keep your SQL server as a SQL server engine. Boxes are relatively cheap now, so do yourself a favor invest in a decent SQL box. Anti-virus - ideally you won’t even need this on the SQL box but if you want it here read the items on what to exclude from your anti-virus scans. 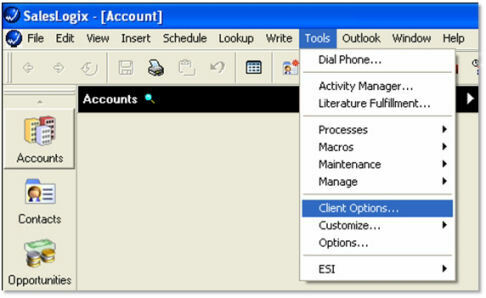 Reindex your databases on a regular database - you can use a maintenance plan to make this happen on a regular basis. There are a number of articles and websites that discuss SQL maintenance. One of my favorites is http://www.sql-server-performance.com/. Open SQL Query Analyzer logging in as a sa equivalent user. You must stop and start the SalesLogix service for this to take effect. Also, with writable cursors, you should explicitly define your locktype (oRS.LockType = adLockBatchOptimistic). There are a number of other coding issues that could improve performance - you should have peer reviews and review your code to make sure you do not leave any open cursors out there - they will kill your SalesLogix performance. Hopefully future releases of SalesLogix will help SalesLogix perform better, but each one of these tips does a little bit more to improve your performance, but taken in total it can help a sluggish SalesLogix installation. And all the other people who have posted great articles in the SalesLogix Business Partner newsgroups. I tried running SQL statment to configure the packet size, but it doesn't seem to work. I'm on SQL2k logged in as sa. 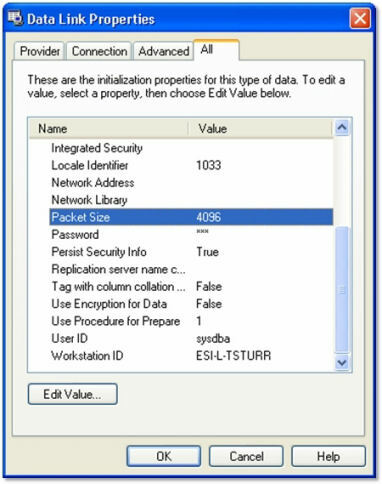 The configuration option 'network packet size' does not exist, or it may be an advanced option. with the changing the packet setting item does this have to be done will all machines at once or can a fe be changed at a time. I just implemented the packet size change in my development environment and it cut my look up time from 15 sec to 4 and switching from accounts to contacts from 8 sec to 3. Can I bump the packet size up more or is 8192 the optimal value? My users and I thank you for these great and well organized tips! is packet size gone in 7.2? i couldn't find it. can it go in the extended properties, or is it not needed at the connector level?